I forgot to tell you to please take Bonnie Lassie of the for sale by owner list. I have decided to keep the boat. I think that I never wanted to sell her . Very good condition. 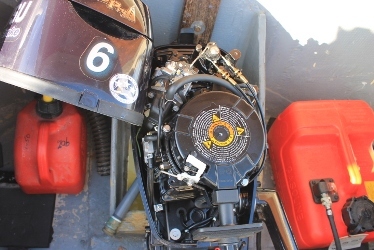 Newer (2017)Tohatsu 6hp sail pro. 15hrs. New Lowrance Hook 5" gps/chart plotter/depth sounder. Roller furling with 140% genoa, plus smaller jib. 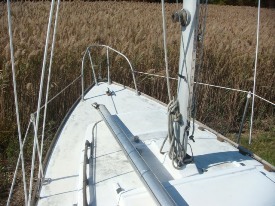 Main sail in good condition. Boat located in Punta Gorda,Florida. October 26, 2012. Eric and Joan Woods checking in as the new owners of Bonnie Lassie. Checking in to say that Bonnie Lassie is fine. 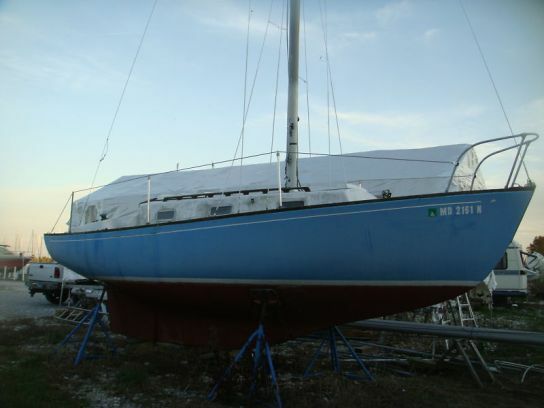 She is still in Punta Gorda and she is almost finished and looks great. The picture you have on the website (at left) is from our first sail in which we entered the Lukeimia Cup Race in Charlotte Harbor, Punta Gorda, Florida. We had a great weekend of sailing. She has been re-varnished inside and very yacht like. At this point we pick up Bonnie Lassie's story with her prior owners. This is how it all started. On January 22, 2011. Julia Sinclair checked in as the new owner of Bonnie Lassie, Yankee #175. Here is her email - edited. I love your website and am very grateful for it. I have recently purchased Bonnie Lassie #175 and she will be living in south Florida, if they can get her out of her icy boatyard in Maryland soon. 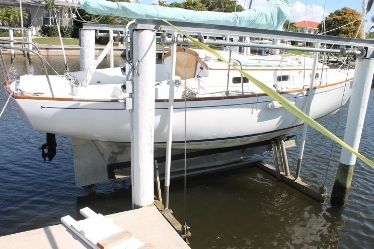 Once in Florida she will head to a boatyard for cleaning and repairs and tons of attention, whereupon she will return to the water in a much-loved condition. I would love to have her full history as well as her various past names if there have been changes over the years. I'm happy to hear that Bonnie Lassie has found an owner who will be able to give her the attention she deserves. The "Alan" on the EBay ad is Alan Lunn, and was representing PlanetHope Sail. They are a non-profit social service organization that operates a sail training program for inner city kids out of one of the marinas in Washington, D.C. I donated the Dolphin to them last fall. At that time Alan said he already had several sales prospects for the boat and he was pretty excited about this one. Most of what they get is in much worse shape, and not nearly as classic a vessel. In any case I'll send along any additional information that I am able to find. 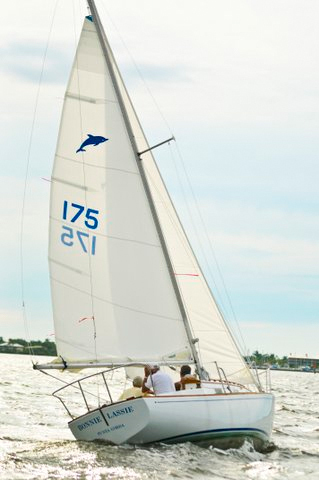 Bonnie Lassie, Hull #175, has arrived in Florida. They finally dug her out of the Maryland snow and ice and now she sits smiling in the south Florida sunshine. Unfortunately she looks like something the cat dragged in and we have our work cut out for us. But that's a long story for another day. One interesting bit of info: she arrived with two old, and probably original, mainsails. One is hers and sports a blue Dolphin and the numbers 175. 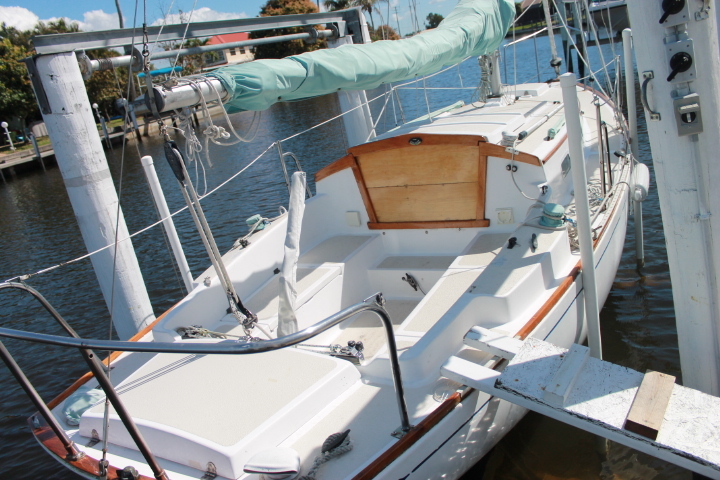 The other looks to be the original mainsail off of Dolphin #83 and sports a green Dolphin. Boat number 83 resides, as you know, in Marina del Rey, California. If only Dolphins could talk! Then we might learn how all this came to be. By the way, I am enjoying your Dolphin book very much and use it often for ideas and as reference material. Many thanks! The hull is finished (three coats of white primer and two coats of shiny white paint with tons of sanding in between everything), I just have to do five coats of sealant followed by two coats of ablative on the bottom, replace the centerboard cable with Spectra, replace two old through-hulls to cockpit drain and sink drain. 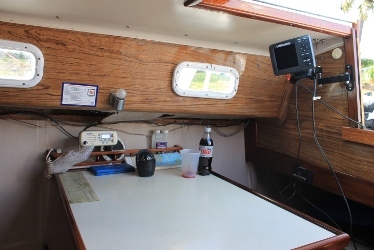 After the new depth sounder transducer is installed she'll be put in the water and motored to my house where she'll get her rigging, mast, roller furler, decks sanded and painted, deck hardware re-set, and brightwork done. Should be fun. Thennnn, I will start in on the interior! Does this photo remind you of a more famous image? That's me holding the furler so it doesn't whack the new non-skid I've just put on (Kiwi- Grip). The mast-raising event felt like a good old fashioned barn raising with all the neighbors lending a helping hand. Nothing like having one's Dolphin in the backyard. I sewed a new jib this week and after putting it on the furler we went for a quick 2 hour first sail in the harbor using the new jib and the very old mainsail. Now I must knuckle down and get the wood work done! 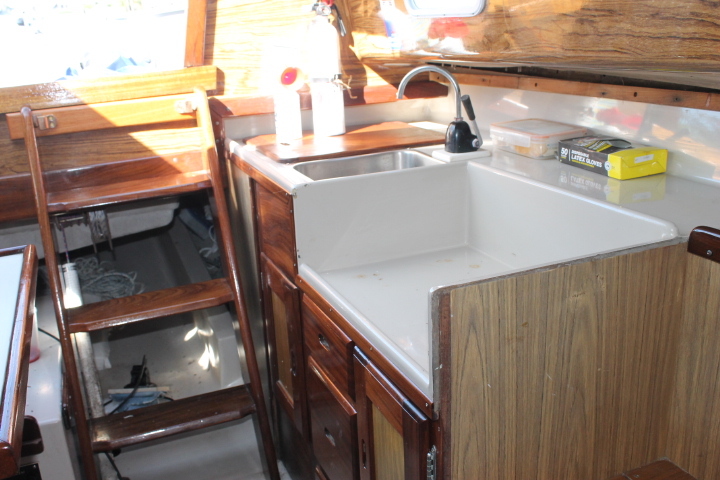 Obviously there is still much to do: teak, stanchions, pulpits, new mainsail, tuning the rigging, etc., etc., etc. Interior will be this Fall's project. On September 28, 2012. Well, Julia was not with us very long. She advised that she has sold Bonnie Lassie and has 'moved up' in the headroom game. We are standing by for the new owner to check in. Here is Julia's email. It has been forever since I last wrote you. I hope you are well. Here is a quick update on Bonnie Lassie #175.I sold her last autumn to a very nice couple who live one canal over from me. She is in very good hands. Here (above) is a photo of her racing last winter after I sold her. 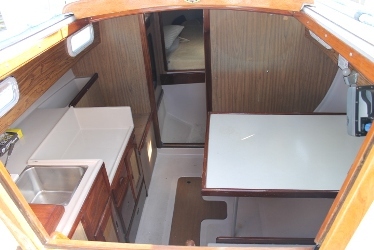 After having such success restoring Bonnie Lassie, I have subsequently moved on to a much larger restoration project - a 1968 Allied Seabreeze 35 derelict who is coming along nicely. Here is what info we had on Bonnie Lassie up to the point that Julia bought her. December 21, 2010. Ian Holzmacher, Yankee #122 brought this to our attention. Bonnie Lassie is for sale on Ebay. Photos are from the ad. Other photos available there as well. 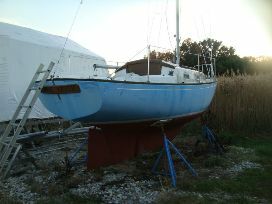 Bonnie Lassie has a blue (painted) hull, originally white, and she had an outboard in the well. The starting bid is $1950. No outboard, no trailer - Located Edgewater, Maryland. February 21, 2010. Not hearing from David in a while we tracked him down and spoke a bit about Bonnie Lassie and website developments. 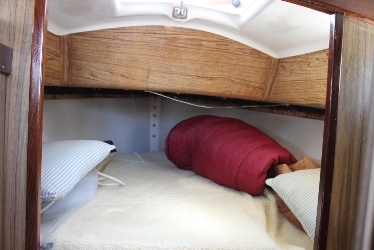 David advised he has made the 'headroom' move and now has a Tarten 30, as well as Bonnie Lassie. Our girl is on the hard. We hope to get some pictures soon. David sent in the following email on November 24. Please add "Bonnie Lassie", 1970 Yankee-built Dolphin 24 to the roster, hull number 175. I purchased her here in Annapolis three years ago and am (very) slowly trying to bring her to a more presentable condition. 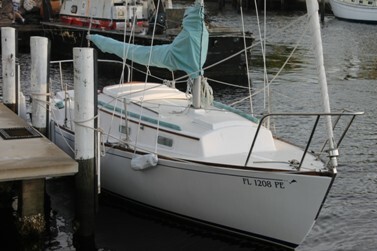 She's a sweet sailor, currently out theSouth River on the western shore of the Chesapeake south of Annapolis. Also I've noticed another Dolphin in our marina that has been sitting all season, but haven't seen the owner at all. She is not currently registered and tiller has been removed (for security purposes, I'd guess), so it may be awaiting "appropriate funding" as many owners will understand. I'll forward more information on this one if I can get it. 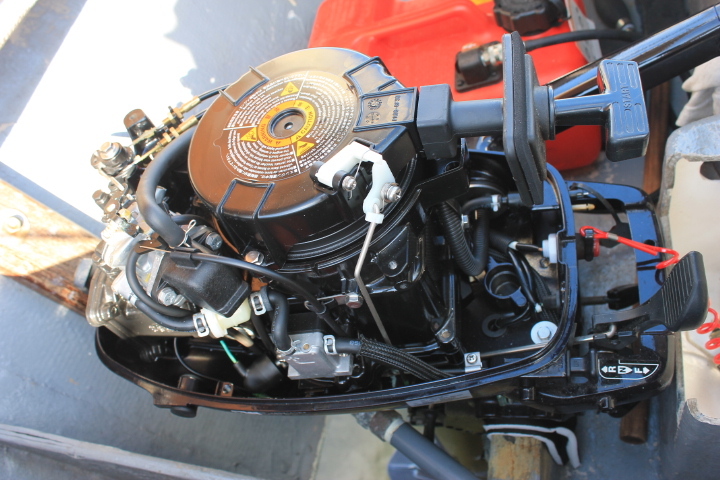 Thanks for the Forum, it's a great place learn about this fine little vessel.